Today in Masonic History Habibullah Khan passed away in 1919. 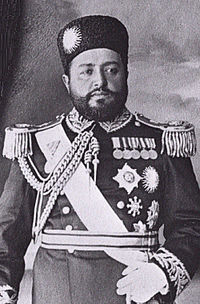 Habibullah Khan was the Emir of Afghanistan. Habibullah was born on June 3rd, 1872 in Samarkand, Uzbekistan. In 1901, Habibullah was a secular, reform minded ruler. He made many attempts to modernize his country. He founded the Habibia school as well as the country's military academy. He also reformed the laws of Afghanistan, removing many of the harsh penalties that were applied to criminals. Before he made many of the changes, one of his chief advisors was accused of apostasy, abandoning his religion and was stoned to death. He also dismantled the oppressive intelligence agency that his father had established. In 1905, Habibullah signed a peace treaty with India and in 1907 made an official state visit to the country. During World War I, Habibullah maintained Afghanistan's neutrality, despite efforts by the Ottoman Empire and the German military to bring them in to the conflict. Habibullah was assassinated on a hunting trip in Laghman Province on February 20th, 1919. During Habibullah's official visit to India he Lt. Col. A. Henry McMahon who was placed in charge of Habibullah's visit to India. McMahon was a member of the British military and a Freemason. After just a few days Habibullah approached McMahon about becoming a Freemason. At first McMahon questioned the Emir's motives. McMahon was skeptical that the Emir wanted to bring Freemasonry back to Afghanistan. Eventually McMahon sought permission from the District Grand Master of Punjab and the Grand Master of the United Grand Lodge of England. Both, in the interest of diplomacy, gave their permission for his initiation. Habibullah was imitated into Lodge Concordia, No. 3102 taking his obligation on a Koran which is now in the Library of the Grand Lodge of England. The lodge had a small and exclusive membership. As McMahon had thought, Habibullah did not bring Freemasonry back to Afghanistan, in fact his membership needed to kept secret in Afghanistan. All records of his initiation were kept in India. Shortly after his return rumors began to circulate about his membership in the fraternity. He was forced to acknowledge publicly that he was a member of the fraternity. He stated that the things he learned in the masonic lodge and the people he encountered encouraged him to modernize his country.